185231st March, Lieutenant Governor, the Honourable George Cathcart, succeeded Sir Harry Smith as Governor. Early 1850’s it is as hazardous to board a ship in Table Bay with a strong wind blowing, boarding an omnibus in the town itself. The South-Easter blew sand and dust from the streets and blinded pedestrians. The wooden blocks with which Adderley Street, Darling Street and Sir Lowry Road had been paved had proved a dismal failure. The roads became muddy pools and in winter people sank up to their calves in it. Sir Lowry Road was so badly pot-holed that omnibus passengers were warned that travel was unsafe. 1852 Charles Bell examined, what was believed to have been a wreck, in the bed of the Hardekraaltjie stream, in the northern suburb of Bellville. His report indicated that the wood found, was part of a large vessel, upwards of seventy feet in length, wrecked about 15 kilometers from the present shoreline. According to Greek mythology, the Greek philosopher, Herodotus, had told of how some six hundred years years BC, Phoenician mariners had reached the southern extremity of Africa, where they had spent some time on shore. As recently as the 1980’s, post graduate students from the University of Cape Town’s Department of Archaeology, also investigated the possible remains of a prehistoric ship, buried in the northern suburb of Maitland. Unfortunately no remain of an ancient vessel was found. 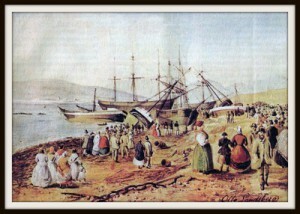 The growth of the Colony, the opening up of the interior and the development of trade in Cape Town had greatly increased the volume of maritime traffic that anchored in Table Bay. In spite of numerous petitions during the past thirty years, the anchorage remained totally unprotected. Between 1839 and 1854 no fewer than two hundred and three vessels were wrecked on the South African coast, the greater proportion meeting their end on the shore of Table Bay. During one storm alone in 1842, seven ships struck with the loss of one hundred and ninety lives. 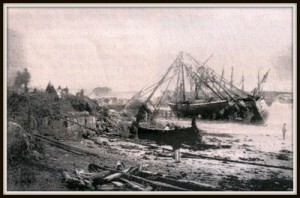 Then, in September twelve years later, sixteen vessels were wrecked within a fortnight between Salt River and Blaauwberg. The Union Steamship Company, one of the forerunners of the Union Castle Line, had been awarded the mail contract subject to its instituting regular monthly sailings between England and Table Bay, made urgent representations to the Government to improve facilities in the Table Bay. In 1853 the Commercial Exchange wrote to the Colonial Government and to the Admiralty and asked that steps be taken to prepare a more detailed chart of Table Bay for the large number of ships calling at Cape Town. Two years later none of the plans devised for shipping and for the offloading of cargoes had been carried out. In 1859 the Exchange again complained of the continued uncertainty dogging the work of the Table Bay harbour and breakwater. 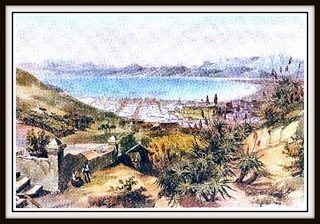 The intended visit of Queen Victoria’s son, Prince Alfred, threw Cape Town into a flurry of preparation; during his visit the Prince laid the foundation stone of the new breakwater. The Albert Dock, which in later years incorporated a dry-dock, was constructed in the lee of the breakwater. Once completed, it greatly contributed to the development of Cape Town as a major port. On completion, the dock was 335,28 metres long. Its construction took nearly nine years. It was opened for use on 17th May 1870, but ships were already unloading in the outer basin early in 1868. The dock had hardly been completed when the need to accommodate larger ships became evident, and Sir John Coode was again asked for advice. He proposed a further extension of the docks and in 1880 a map based on his plans was printed. Prince Alfred also inaugurated this extension on 11th July 1870. 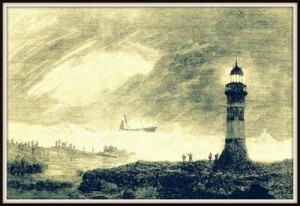 A lighthouse had been constructed on Robben Island and in False Bay, a great step forward in the development of Cape Town as an international port. On 17th November 1869 the Suez Canal was opened to navigation; it reduced the distance by sea between Western Europe and India by nearly 5 000 sea miles. This signalled the end of Cape Town as a halfway port. International shipping would in future only use it in emergencies, or when war closed the Canal. 1854 18th August The name of the Keizersgracht is changed to Darling Street in honour of the Lieutenant Governor. 1854 The Cape’s first representative Parliament is elected. 1854 1st July, After some delay, Lieutenant-Governor Darling opened the first Cape Parliament in the ballroom of Government House, Cathcart having been killed at the battle of Inkerman in the Crimea. 1854 5th December, Sir George Grey arrives in Cape Town and was sworn in as Governor and High Commissioner. He is the first civilian Governor since the Earl of Caledon. Sir George was a brilliant administrator who did all in his power to further the interests of the Colony. 1855-1858 Roeland Street Goal. Only the facade and stone boundary walls of the original gaol, built on this site, remain. The gaol was demolished in the late 1970s, but it was agreed that because of its landmark quality and architectural and historic interest in terms of the Victorian prison ethic, the Roeland Street facade and stone boundary walls be retained as part of the newly built Western Cape’s Archives Building. 1856 The population of Cape Town is 25,189. 1858 There are 3,528 houses and 363 stores in Cape Town. 1858Layers of sandstone, broken into small lumps, are placed as a foundation in Strand Street, and then finished with a hard surface. The street was paved in the centre with tar, and on the sides with pebbles. The recently appointed town engineer had also advocated the abolition of “unsightly stoeps” and their replacement with paving. 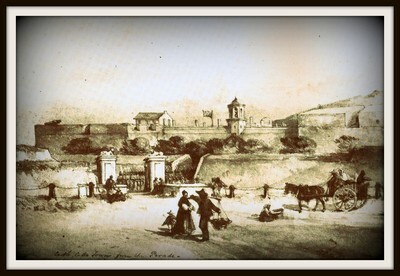 The demolition of the stoeps commenced in earnest in 1862. Fortunately for us a few have survived. The canals or grachten, with their many picturesque footbridges, had in the past greatly contributed to the Dutch character of Cape Town, but they were no longer what they used to be. The water and sewage, which they carried off, sometimes in raging torrents, filled them only in winter, and at other times of the year they were often rubbish-filled and sluggish eyesores. In the 1860’s when Cape Town began to rid itself of its canals, they unfortunately also lost the charming bridges in the process. Only in the later drawings of Thomas Bowler do we see filled-in ditches, of which the old Heerengracht was an example. The change of name also signified a change in character. It became a street and was no longer a gracht. The water went underground. The Adderley Street canal was arched over at the same time, and the canal in Wale Street was filled in soon thereafter. The closing of the other old grachts and ditches proceeded slowly, so slowly in fact, that thirty years later most of the streets were still unpaved. Street cleaning remained the responsibility of the individual householder; each homeowner swept the road in front of his property. The removal of refuse left much to be desired and sanitary services were primitive. As early as 1849 the Commercial Exchange had formed a committee to investigate the economic aspects of constructing a railway-line to the first range of mountains. The main difficulty was raising sufficient capital, but in 1854 a company was formed in Britain, which undertook to proceed with its plans, provided the Cape Government guaranteed a moderate rate of interest. Sir George Grey took an immediate and great interest in these plans. Parliament passed the railway bill; a route was surveyed between Cape Town and Wellington. It began at Fort Knokke (close to Woodstock station today). The site of the railway station has always been a matter of contention in Cape Town. 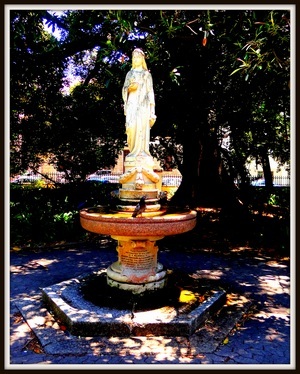 It was eventually decided that it should be as near the centre of Cape Town as it can be. 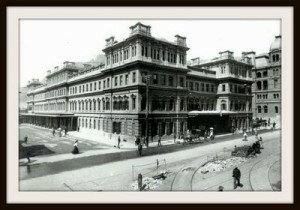 In the end, a railway station was constructed between the Commercial Exchange and the Customs House, at a corner of the Parade. 1859 31st March, Sir George Grey, in pouring rain, turns the first sod for the new railway-line at the spot in present-day Woodstock. Sir George used a silver spade bearing his coat of arms and an allegory of Commerce. 1859, Sir George Grey establishes the Cape Board of Examiners. The Cape Board of Examiners held professional examinations and issued diplomas in law, surveying and other subjects. This body was the forerunner of the University of the Cape of Good Hope, which was established in 1873 and from which all other South African Universities developed. 1859 The Old Locomotive in Cape Town station arrive in South Africa together with its driver, William Dabbs. The locomotive was probably used in the construction of its own track to Eerste River. It was made by Hawthorne of Leith in Scotland. The standard gauge of 1,434 metres was used, but when the Cape Government took over the Railways in 1873, it decided to adopt a gauge of 1,066 metres for all lines and to alter old lines accordingly. To avoid the immediate loss of all rolling stock, an intermediate rail, was placed between the existing ones. When the conversion to the narrower gauge, was completed in 1881 the period of service of the old engine and of its driver came to an end. 1860 The telegraph makes its appearance in Cape Town. Its main function was to provide news of the arrival and departure of ships in Simon’s Bay (Simons Town). 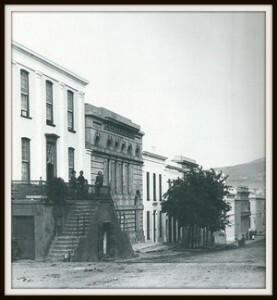 The telegraph office was situated in a kiosk at the corner of Adderley and Darling Street. 1860 Prince Alfred, second son of Queen Victoria, visits the Colony, on the suggestion of the Governor, who acts as the Prince’s host while he is in Cape Town. 17th September, Prince Alfred, tipps the first load of rubble into the Bay. In the meantime, electricity had come to Cape Town. In honour of Prince Albert’s visit in 1860, a Mr. Bishop had offered to illuminate the Commercial Exchange building ‘with electric light on the roof.. During Prince Alfred’s first visit, an evening celebration had been held in the Avenue, romantically illuminated by hundreds upon hundreds of flickering Japanese lanterns hanging in the oaks. When Edward the Prince of Wales married Alexandra of Denmark in 1862, Cape Town went almost hysterical with joy. Days of celebrations included an enormous carnival procession. 76 and 78 Strand Street. These two double-storey buildings are regarded as important examples of Cape Town’s early building heritage. No 76 was probably erected around 1860. No 78 probably date from the same period, but have undergone some sensitive modernisation in the 1880’s. Many interesting Victorian buildings have survived the onslaught of modernization. No 140 was built c 1859, no 142 c1898, a. These three buildings, with their Victorian and Edwardian characteristics, form an integral part of the historical and architectural character of Long Street. These buildings are the property of the Department of Economic Development and Tourism, and house a Tourist Information Centre. 1861 January The Commercial Exchange change its name to the Cape Town Chamber of Commerce. 1861 August Sir George Grey leaves the Cape to become Governor of New Zealand. The Grand Parade, like the Garden, had been reduced in size over the years by the encroachment of new buildings, but it was still the city’s most important rallying point. When the circus was in town, its wood, iron and canvas structures were always erected in the middle of the grounds. The fire brigade also demonstrated its skills here. 1862, Preparations for the tramway to Green Point and Sea Point, is started. The tramline passed directly from Long Street down Shortmarket Street to Greenmarket Square, instead of taking the longer route down Wale Street. The line passed St. Andrew’s Presbyterian Church in Somerset Road and continued from there to Green Point and Sea Point. Even before it was completed, it was realised that some parts were too steep for horse-drawn trams. The two horses were unable to pull a large load all the way, and passengers were asked to alight and walk next to the tram as far as Long Street. This section was therefore abandoned and the terminus of the trams was moved from Greenmarket Square to Long Street, where the trams drew up in front of the former Y.M.C.A. building. The line was completed in June 1863. The Sea Point terminus, tram-sheds, stables, and a forge was at the corner of what was later Tramway Road. Behind the sheds and up the road cottages were built for the Coloured drivers, grooms and stable hands. Riding in a tram was not as comfortable as was anticipated. Passengers were often jolted about and the fearful rattling made conversation impossible. In wet weather it was no pleasure to sit on the upper deck – it was open. The rails were often cluttered with stones. Nevertheless, for over 20 years, it was the only tramline in the Peninsula and, because it afforded an easy connection with the city, Green Point and Sea Point developed into the prosperous suburbs they still are. 1863 The railway line to Wellington is completed and the engine put into service. 1863 July The Confederate ship, the Alabama, visits the Cape. 1863 The the first Synagogue in South Africa, the Gardens Synagogue is consecrated. Situated in Paddock Avenue in the Gardens, it design is a simple temple form with a stone and plaster front and an unusual mixture of Greek and Egyptian motifs for decoration. It has a granite base steps, pink polished granite basin, painted cast-iron pedestal and figure (“Wills Bro South London”), brass lions-head outlets. It is set on the Tuynhuys axis. 1864 The noon gun is fired by electricity. 1864 The railway line to Saltriver and sWynberg is opened. 1864 A statue of Sir George Grey is erected in the Company Gardens, in front of the South African Library. 1865 17th May, 17 Ships are wrecked in the Bay, including the Athens at Moiulle Point. A part of the engine is still visable. 1867 Cape Town achieves full municipal status. The town is devided into six districts. 1867 The multi working-class area just off the centre of Cape Town, to the south of the Castle, is named the sixth District of Cape Town. 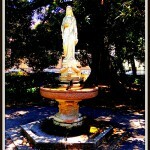 It was originally established as a community of freed slaves, merchants, artisans, labourers and immigrants. 187017th May Prince Alfred returns for the third time and openes a further section of the harbour development.